A mast radiator (or radiating tower) is a radio mast or tower in which the entire structure functions as an antenna. This design, first used in radiotelegraphy stations in the early 1900s, is commonly used for transmitting antennas operating at low frequencies, in the VLF, LF and MF ranges, in particular those used for AM broadcasting. The metal mast is electrically connected to the transmitter. Its base is usually mounted on a nonconductive support to insulate it from the ground. A mast radiator is a form of monopole antenna. In radio engineering, an antenna is the interface between radio waves propagating through space and electric currents moving in metal conductors, used with a transmitter or receiver. In transmission, a radio transmitter supplies an electric current to the antenna's terminals, and the antenna radiates the energy from the current as electromagnetic waves. In reception, an antenna intercepts some of the power of a radio wave in order to produce an electric current at its terminals, that is applied to a receiver to be amplified. Antennas are essential components of all radio equipment. Most mast radiators are built as guyed masts insulated from the ground at the base. Steel lattice masts of triangular cross-section are the most common type. Square lattice masts and tubular masts are also sometimes used. To ensure that the tower is a continuous conductor, the tower's structural sections are electrically bonded at the joints by short copper jumpers which are soldered to each side. Base feed: Radio frequency power is fed to the mast by a wire attached to it, which comes from an antenna tuning unit inside the "helix building" at right. The brown ceramic insulator at the base keeps the mast isolated from the ground. On the left there is an earthing switch and a spark gap for lightning protection. At its base, the mast is usually mounted on a thick ceramic insulator, which has the compressive strength to support the tower's weight and the dielectric strength to withstand the high RF voltage applied by the transmitter. The RF power to drive the antenna is supplied by an antenna tuner unit, usually housed in a small building called a helix building next to the mast, and the cable supplying the current is simply bolted to the tower. The actual transmitter is usually located in a separate building, which supplies RF power to the helix building via a transmission line. Radio frequency (RF) is the oscillation rate of an alternating electric current or voltage or of a magnetic, electric or electromagnetic field or mechanical system in the frequency range from around twenty thousand times per second to around three hundred billion times per second. This is roughly between the upper limit of audio frequencies and the lower limit of infrared frequencies; these are the frequencies at which energy from an oscillating current can radiate off a conductor into space as radio waves. Different sources specify different upper and lower bounds for the frequency range. Antenna tuner, matching network, matchbox, transmatch, antenna tuning unit (ATU), antenna coupler, and feedline coupler are all equivalent names for a device connected between a radio transmitter and its antenna, to improve power transfer between them by matching the specified load impedance of the radio to the combined input impedance of the feedline and the antenna. A helix building is a small structure at the base of a longwave or mediumwave radio transmitter. Within, there are capacitors and coils for coupling the signal from the feed cable to the antenna. The building may also contain lightning protection devices. Active components such as amplifiers are usually not housed in a helix building. Free-standing towers are also used as radiating structures. These towers can have a triangular or a square cross section, with each leg supported on an insulator. One of the best-known radiating towers is the Blosenbergturm in Beromünster, Switzerland. Fiberglass masts are sometimes used for small constructions. The Blosenbergturm is a former radio transmission tower built for the German-language radio station DRS at Beromünster in the Canton of Lucerne, Switzerland, in 1937. It radiated at 531 kHz, the lowest officially allocated frequency in the European medium-wave band. The ideal height of a mast radiator depends on transmission frequency, demographics for the location, and terrain. For radio systems in the longwave and mediumwave range, the value of the height should be in the range between one sixth and five eighths of the wavelength, with preferred values at the quarter or the half of the radiated wavelength. When this is not possible, masts with a loading coil, 'capacity hat' or similar loading arrangement are used. A loading coil or load coil is an inductor that is inserted into an electronic circuit to increase its inductance. The term originated in the 19th century for inductors used to prevent signal distortion in long-distance telegraph transmission cables. The term is also used for inductors in radio antennas, or between the antenna and its feedline, to make an electrically short antenna resonant at its operating frequency. The height of the mast determines the radiation properties. For high power transmitters in the MW range, masts with heights around half of the radiated wavelength are preferred because they focus the radiated power better to the ground than structures with heights of quarter wavelengths, which are preferred for economical reasons for low power medium wave transmitters. A focus of radiated power towards the ground is much desired on frequencies below 3 megahertz, because groundwave propagation is very stable. Masts longer than five eighths of the wavelength are normally not used, because they show bad vertical radiation patterns, so masts for mediumwave transmitters do not normally exceed 300 metres. For longwave transmitters, however, the construction of masts with heights of half-wave wavelength is generally not economically viable and in most cases impossible. 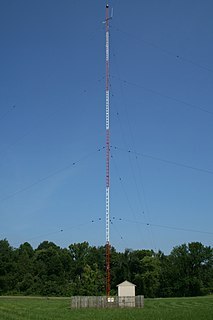 The only longwave radio mast with a height of the half length of the radiated wavelength was the Warszawa Radio Mast at Konstantynów, Poland. At the time of its collapse in 1991 it was the tallest manmade structure in the world, at 646.38 metres (2,120.67 ft) tall, for a wavelength of 1292.76 metres (frequency 232 kHz). For frequencies below longwave, masts are electrically enlarged by loading coils or capacity hats on the top, because masts of even quarter wavelength would be too high to be practical. Sectional: the structure is divided into usually two sections with insulators between, usually center-fed. This collinear arrangement enhances low-angle (ground wave) radiation and reduces high-angle (sky wave) radiation. This increases the distance to the mush zone where the ground wave and sky wave are at similar strength at night. This type of antenna is known as an anti-fading aerial. Practical sectionals with 120 over 120 degrees, 180 over 120 degrees and 180 over 180 degrees are presently in operation with good results. There is usually an antenna matching unit to match the impedance of the transmitter or feeder to the antenna. Depending on the power involved, this may be a small box or a hut or building. It will typically contain an L-network to transform the modulus of impedance, and a coil or capacitor in series with the mast connection to 'tune out' any reactive component. At some facilities, especially the older and higher-powered installations, the mast radiator may be located at some distance from the transmitter building, in order to reduce the field strength induced by the mast into the building, and to prevent the building from distorting the mast's radiation pattern. Between the transmitter building and the antenna matching unit next to the mast radiator, there is a feeder: either an underground coaxial cable or an overhead wire 'cage' feeder. At facilities with multiple masts, spacings are typically smaller, in order to fit them into the available space. At modern transmitters or at low power transmitters situated in very small transmitter buildings the transmitter, matching unit and mast radiator can be very close together and even in the same building. This measure saves on feeders, land area and increases the efficiency of the transmitter if only one mast radiator is in use. At most facilities the mast radiator is on a separate base close to the antenna matching unit, but it can be sometimes be placed on the roof of the antenna matching unit, for example at the main transmission mast of the Mühlacker radio transmitter and the main transmission mast of the Ismaning radio transmitter. For a good groundwave propagation, mast radiators are built on a large flat area with good ground conductivity and if possible without inclination. The construction of a mast radiator on the top of a building or tower whose height is in the same magnitude range as the wavelengths being transmitted gives a bad groundwave propagation. For this reason, mast radiators are (in contrast to FM broadcasting antennas) not typically installed on the top of buildings or towers. Nevertheless in rare cases, mast radiators for low power transmissions are installed on top of buildings. Some lighthouses, such as Reykjanesviti carry a mast radiator for a longwave radio beacon on the roof. The best-known are WGSO in New Orleans and KSBN (AM) on the Delaney Building in Spokane, Washington. In Europe, the low-power broadcasting station at Campobasso uses a mast radiator on a castle. Mast radiators, as with all other equipment showing over 42 volts on exposed components within 4 metres of the ground, are required to be fenced in. Usually a chain-link fence is used, but sometimes wooden fences are used in order to prevent signal interference, which could occur due to currents induced by radio signals in metallic fences. If the mast radiator is mounted on the top of the helix building, which must be over four metres in height; or the mast is grounded, with the feed being located not less than four metres above the ground, a fence is not required. Nevertheless it is always recommended to fence in any mast radiator in order to prevent unauthorized climbing. A mast radiator may need various electrical connections other than the transmitter feed line. Such connections include static drain chokes (which drain off static charges caused by wind, clouds, etc. ), spark-gap balls for lightning protection, power supplies for aircraft warning lamps, and coaxial feeders for ancillary antennas mounted on the mast. A variety of techniques are used to 'isolate' these connections from the high RF voltage on the mast, such as chokes, parallel tuned circuits and coupling loops, on a base-fed mast. On a shunt-fed mast, where the base is grounded, such measures are unnecessary. Capacitive "top hat" on mast is occasionally used for electrical lengthening, to allow a shorter mast to be electrically resonant. An anti-fading antenna (informally and often incorrectly termed a "Franklin" antenna) is a long- and medium-wave transmission antenna with a flat vertical radiation pattern. The design goal is to move the mush zone farther from the transmitter site. An anti-fading antenna will reduce radiation at elevations of more than 50 degrees as much as possible. In principle, such a radiator should be as thin as possible, although thicker radiators improve the bandwidth and contribute to a taller effective height. These antennas are usually constructed using a metal radio mast, which is fed both at its base and at an appropriate height. The radio mast is usually insulated from ground and is divided electrically by a separation insulator into two parts. For feeding of the upper part, either a cable inside the mast construction or the ladder, which must be mounted on insulators, is used. This design is employed in the Mühlacker, Wolfsheim and Hamburg medium-wave transmitters. Anti-fading antennas with two separation insulators are installed at Ismaning. Because separation insulators are fragile compared to the construction of the radio mast framework, horizontal forces, such as those generated by wind-caused oscillations, need to be minimized. Radio masts with built-in separation insulators may employ oscillation dampers just above the separation insulator. This approach is used on the radio masts of Wolfsheim, Hamburg and Ismaning. A simple anti-fading antenna is a vertical radiator whose height is between 1/2 wavelength (180 electrical degrees) and 5/9 wavelength (200 degrees), 195 degrees being considered ideal. 200 degree and taller simple radiators have largely fallen into disuse, although these can be useful on medium power stations, in which case radiators as tall as 5/8 wavelength (225 degrees) are somewhat common. Any simple radiator (or array of radiators) which is taller than 195 degrees is generally not considered to have anti-fading properties. A more complex anti-fading antenna is a vertical radiator which is sectionalized and is one wavelength (360 degrees, generally 180 over 180 degrees, and historically and correctly termed a "Franklin" radiator; two in an array at KFBK), or 300 degrees (180 over 120 degrees, and formally called a WHO radiator), or 240 degrees (120 over 120 degrees, and formally called a WOAI radiator, but WOAI has since replaced this with a 195 degree radiator for lower maintenance cost at the expense of somewhat poorer "fringe" reception). Several have been incorporated into phased arrays (directional antennas). When so sectionalized the sections are themselves phased so as to provide the optimum vertical radiation pattern (suppressing high-angle radiation). An advantage of the 180 over 180 degree configuration is no ground radial system is required, and the bottom of the lower section may be insulated from the ground; for the others, the bottom of the lower section is usually connected to a ground radial system through a capacitor. Another form of anti-fading mast antenna is a circular array antenna, in which a number of mast radiators are arranged on a circle and fed in equal phase. With this design, very flat radiation patterns may be produced, although they are very expensive since multiple radio masts are required. Taldom transmitter and Tulagino transmitter in Russia are currently the only radio stations in the world using such antennas. At one time, longwave transmitter Orlunda in Sweden also used an antenna of this type. The tallest mast radiator ever built was the Warsaw radio mast at Konstantynow, Poland. The antenna was 648.38 metres (2,127.2 ft) high but collapsed in 1991. Currently the masts of the Lualualei VLF transmitter, at 458.11 metres (1,503.0 ft), are the tallest mast radiators insulated against ground. In contrast to the Warsaw Radio Mast, the Lualualei antenna uses extensive electrical lengthening measures. The tallest mast radiator not using electrical lengthening may be the Hellissandur longwave radio mast at 411.48 metres (1,350.0 ft) high. Low frequency or LF is the ITU designation for radio frequencies (RF) in the range of 30 kilohertz (kHz) to 300 kHz. As its wavelengths range from ten kilometres to one kilometre, respectively, it is also known as the kilometre band or kilometre wave. 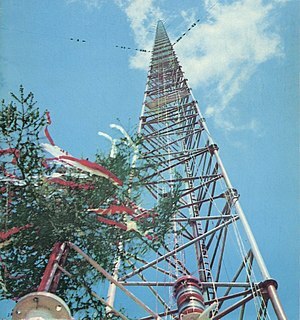 The Warsaw Radio Mast was the world's tallest structure from 1974 until its collapse on 8 August 1991. It was the second tallest structure ever built, being surpassed as tallest by the Burj Khalifa, completed in 2010. A guy-wire, guy-line, or guy-rope, also known as simply a guy, is a tensioned cable designed to add stability to a free-standing structure. They are used commonly in ship masts, radio masts, wind turbines, utility poles, fire service extension ladders used in church raises and tents. A thin vertical mast supported by guy wires is called a guyed mast. Structures that support antennas are frequently of a lattice construction and are called "towers". One end of the guy is attached to the structure, and the other is anchored to the ground at some distance from the mast or tower base. The tension in the diagonal guy-wire, combined with the compression and buckling strength of the structure, allows the structure to withstand lateral loads such as wind or the weight of cantilevered structures. They are installed radially, usually at equal angles about the structure, in trios and quads. As the tower leans a bit due to the wind force, the increased guy tension is resolved into a compression force in the tower or mast and a lateral force that resists the wind load. For example, antenna masts are often held up by three guy-wires at 120° angles. Structures with predictable lateral loads, such as electrical utility poles, may require only a single guy-wire to offset the lateral pull of the electrical wires, at a spot where the wires change direction. The Transmitter Hamburg-Billstedt is a broadcasting facility in Hamburg-Billstedt, established in 1934. It is owned and operated by the Norddeutscher Rundfunk public broadcasting service, but open to competitors, too. Kalundborg Radio is a major transmission facility for long- and mediumwave at the harbour of Kalundborg in Denmark. The Transmitter Ismaning was a large radio transmitting station near Ismaning, Bavaria, Germany. It was inaugurated in 1932. From 1932 to 1934 this transmitter used a T-antenna as transmitting antenna, which was spun between two 115-metre-high free-standing wooden lattice towers, which were 240 metres apart. As this antenna had an unfavourable vertical radiation pattern, which produced much skywave resulting in a too small fading-free reception area at night, in 1934 a new antenna was installed. Therefore, one of the towers was dismantled and rebuilt on a 39-metre-high (128 ft) wooden lattice base. While this work took place, an L-Antenna was used, which was spun between the other tower and a small auxiliary wooden tower. It became defunct in 1977 and was destroyed in 1983. The Rheinsender is a large medium-wave transmission facility near Wolfsheim, southwest of Mainz for the frequency 1017 kHz. The Rhine transmitter was established in 1950 and went on the air May 15, 1950. It belongs to SWR and transmitted until the middle of the 1990s with 600 kilowatts. In the last years the transmission power was reduced to 100 kilowatts. The Mediumwave transmitter Mainflingen is a mediumwave transmission facility south of the A3 motorway near Mainflingen, Hesse, Germany. Mainflingen was the first mediumwave transmitter for the radio station Deutschlandfunk. 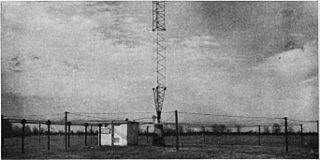 It went into service in 1962 with a transmission power of 50 kW, on a frequency of 1538 kHz, at the upper end of the mediumwave band. This frequency has a bad groundwave propagation and therefore a low range at daytime, but an excellent skywave propagation with a long range at night. The Blaw-Knox company was a manufacturer of steel structures and construction equipment based in Pittsburgh, Pennsylvania. The company is today best known for its radio towers, most of which were constructed during the 1930s in the United States. Although Blaw-Knox built many kinds of towers, the term Blaw-Knox tower usually refers to the company's unusual "diamond cantilever" design, which is stabilized by guy wires attached only at the vertical center of the mast, where its cross-section is widest. A 1942 advertisement claims that 70% of all radio towers in the US at the time were built by Blaw-Knox. A T-antenna, T-aerial, flat-top antenna, or top-hat antenna is a capacitively loaded monopole wire radio antenna used in the VLF, LF, MF and shortwave bands. T-antennas are widely used as transmitting antennas for amateur radio stations, long wave and medium wave broadcasting stations. They are also used as receiving antennas for shortwave listening. A broadcast transmitter is a transmitter used for broadcasting, an electronic device which radiates radio waves modulated with information content intended to be received by the general public. Examples are a radio broadcasting transmitter which transmits audio (sound) to broadcast radio receivers (radios) owned by the public, or a television transmitter, which transmits moving images (video) to television receivers (televisions). The term often includes the antenna which radiates the radio waves, and the building and facilities associated with the transmitter. A broadcasting station consists of a broadcast transmitter along with the production studio which originates the broadcasts. Broadcast transmitters must be licensed by governments, and are restricted to specific frequencies and power levels. Each transmitter is assigned a unique identifier consisting of a string of letters and numbers called a callsign, which must be used in all broadcasts. A monopole antenna is a class of radio antenna consisting of a straight rod-shaped conductor, often mounted perpendicularly over some type of conductive surface, called a ground plane. The driving signal from the transmitter is applied, or for receiving antennas the output signal to the receiver is taken, between the lower end of the monopole and the ground plane. One side of the antenna feedline is attached to the lower end of the monopole, and the other side is attached to the ground plane, which is often the Earth. This contrasts with a dipole antenna which consists of two identical rod conductors, with the signal from the transmitter applied between the two halves of the antenna. The folded unipole antenna is a type of monopole antenna; it consists of a vertical metal rod or mast mounted over a conductive surface called a ground plane. The mast is surrounded by a "skirt" of vertical wires electrically attached to the top of the mast. The skirt wires are connected by a metal ring at the bottom and the feed line is connected between the bottom of the wires and ground. An umbrella antenna is a top-loaded electrically lengthened monopole antenna, consisting in most cases of a mast fed at the ground end, to which a number of radial wires are connected at the top, sloping downwards. They are used as transmitting antennas below 1 MHz, in the LF and particularly the VLF bands, at frequencies sufficiently low that it is impractical or infeasible to build a full size quarter-wave monopole antenna. The Topolná transmitter is the central longwave broadcasting facility of the Czech Republic situated west of the village of Topolná on the Morava River. In electronics and radio communication a counterpoise is a network of suspended horizontal wires or cables, used as a substitute for an earth (ground) connection in a radio antenna system. It is used with radio transmitters or receivers when a normal earth ground cannot be used because of high soil resistance or when an antenna is mounted above ground level, for example, on a building. It usually consists of a single wire or network of horizontal wires, parallel to the ground, suspended above the ground under the antenna, connected to the receiver or transmitter's "ground" wire. The counterpoise functions as one plate of a large capacitor, with the conductive layers of the earth acting as the other plate.